Beautiful! Great fabric selection as well. With such wonderful fabric you can use the runner on each side, there is no back, hehe. Tablerunners are such a great way to decorate. Michelle, I love your patriotic version with Bonnie and Camille fabrics. And, how you quilted the gentle S curve is so striking! I'm going to try that next time. Thank you so much for participating in the book hop! This is a very beautiful runner...I love your confessions of what went wrong and I'm glad you managed to get the smutz off the quilt. Beautiful runner! I love the prints against the Kona background and your wavy quilting compliments nicely with the straight seams. I really like the idea of using some of the lesser used B&C prints for the back, I love B&C too and I also find that I use up their bright prints and their lower volume prints stay in the stash. Thanks so much for being part of the hop!! And your friend is just going to love it! Well done! Your friend will love it - very pretty! Gorgeous! 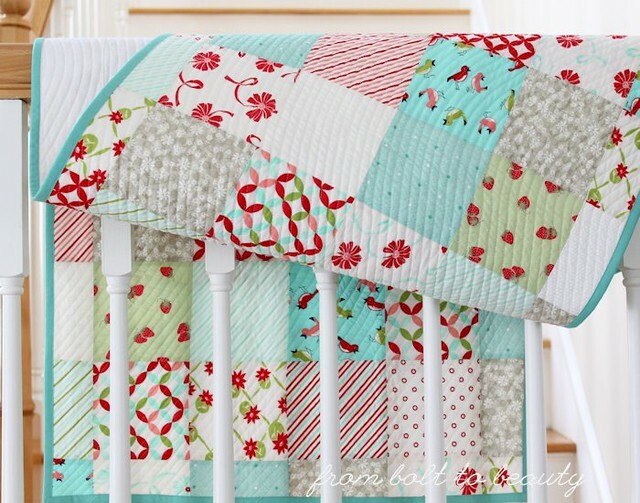 I love this runner and it is on my list...like many other of the quilts in the book! Your friend is very lucky! I love the runner and the tip for quilting with the "S" shape is something I'll have to try. I am sure your friend is going to be thrilled with such a beautiful gift. Great colors for summer, and I’m glad all the tiny pitfalls worked out in the end. Your friend will love this runner, using the s shape just makes this runner, I will be trying this with my walking foot. 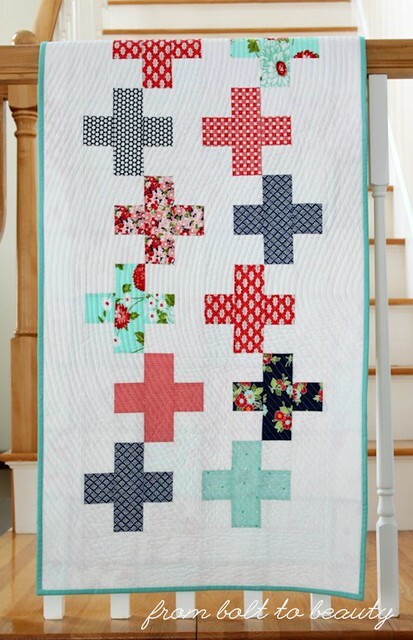 This is so summery, and the large S quilting lines are perfect for the crosses. A super gift. Very nice! I love the pieced backing because now you can flip it over and have a second runner. This quilt turned out so cute! I love the "wave" quilting. I had actually done that from Jacquie's book, recently. I love her book "Walk". Very nice! I like how you used the charms on the back. Great quilting decision. That is one lovely gift, your friend will be more than happy to receive it. A lovely version of the pattern. Gorgeous! REally like your fabrics and Kona Snow is one of my faves too - seems to show off fabrics perfectly. Lucky person to recieve such a lovely gift! Love your runner Michelle, especially the s quilting, nice work! Great idea and beautiful runner, that’s one lucky friend too. Your runner is beautiful, I too love Bonnie and Camille fabrics. Thanks for sharing about the S quilting. I will have to try that some time. I love Bonnie and Camille's fabrics, and they look terrific here on the front and back! Your friend will love it! Lovely runner ! I like the back very much too and your quilting design is perfect. I love those Bonnie and Camille fabrics! In this runner, they look stunning. That soft S curve quilting was a perfect choice. I need to remember this one! What a perfect gift for your friend. I love the fabric choice for red, white and blue but in such pretty fabrics. The quilting design is really effective. 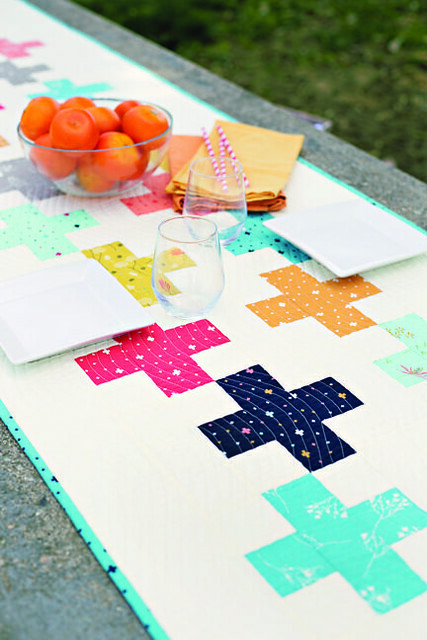 Such a pretty table runner and your quilting is perfect! What a sweet gift for your friend. 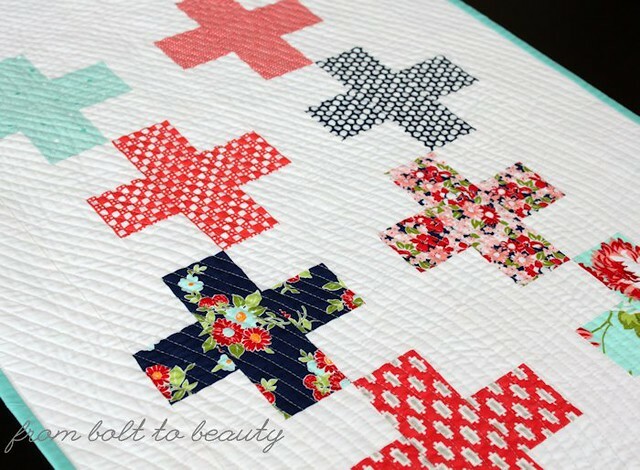 Beautiful runner and perfect quilting! That binding sets it off perfectly! Lovely runner for a lucky friend! I always think it keeps it real and keeps us grounded when real life happens to quilting. Love your runner by the way. Lucky friend. Wonderful tablerunner and the back looks lovely too. The S curve quilting was perfect. Don't you just love wavy quilting?! Well done. Great gift for your friend. 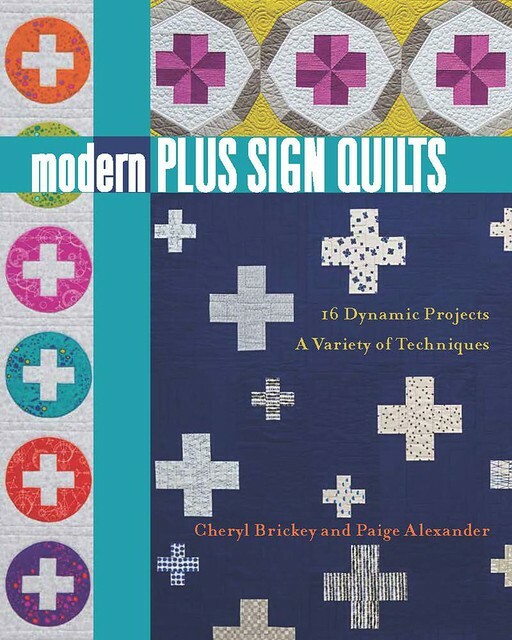 There are a lot of great projects in this book. Your runner is gorgeous, and I love all of the fabrics on the back, it complements the front so well! It is now two sided, so if your friend wants a change they can use the backside. Beautiful work!